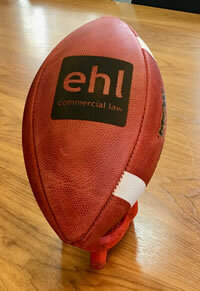 EHL Commercial Law has partnered with Leicester Falcons American Football Club as an Official Sponsor. 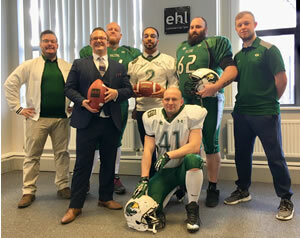 EHL is delighted to be working with Guy Kersey and his team to provide legal support as the Falcons add American Football to the list of prominent sports in the Leicestershire area. 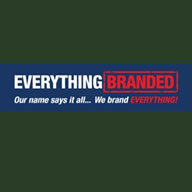 EHL branding will appear on the Falcons’ jerseys and on sponsorship boards at games. The partnership brings EHL a wealth of opportunities to provide sports law assistance, which is an area of specialist expertise for the team. 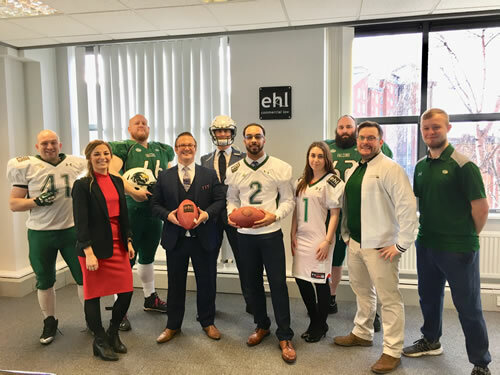 The team at EHL thoroughly enjoyed meeting Guy and members of the Falcons team at the City Gate House office for the formal sponsorship announcement and are excited to develop a long-lasting relationship moving forwards. 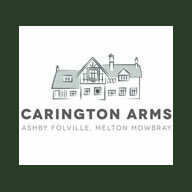 The Falcons have a passion for increasing access to and exposure of American Football in the UK and have a history of successfully progressing through divisions of the British American Football League, having obtained full membership status in November 2007. EHL and the Falcons share a desire to continually develop, innovate and drive for success, positioning this as a natural partnership for the two pioneers. The team at EHL looks forward to supporting the Falcons at their upcoming games and cheering them on as the new match season approaches shortly.